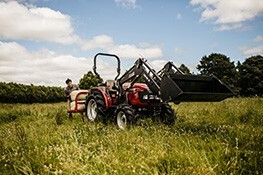 20 to 25 hp: Compact tractors perfect for a lifestyle block or small market gardener. 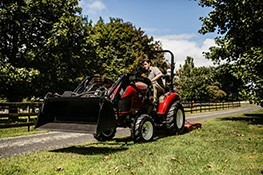 These are easy to operate, have an optional mid-mounted mower deck (therefore could replace your ride on mower), and an optional front loader makes easy work of landscaping or mucking-out duties. They have proper tractor hydraulics (three-point linkage) which can be fitted with a wide range of attachments such as tip trailers, grader blades, mowers, rotary hoes, post hole borers or carry trays. 35 to 50 hp: These are heavy enough to take on the bigger jobs and work hard for your business or lifestyle blocks. Available with a fuel-efficient mechanical gearbox, or easy to operate the hydrostatic transmission. These are popular choices for parks and reserves, schools, plant nurseries and horse studs. 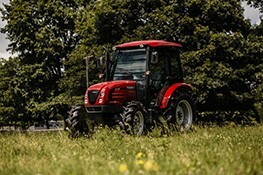 60 hp: The best choice for big tractor performance in a compact package. This is available as a cab version or ROPS (Roll Over Protection Structure) and has enough power and weight to handle large mowers and lift round bales of hay.